Communities@Work is a social enterprise* serving the community in the ACT and wider capital region. 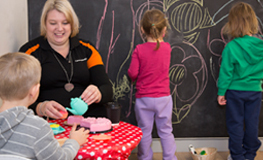 Offering choice and flexibility across numerous centres and sites, we are a leading provider of children’s services. We are a Registered Training Organisation (RTO 88148) offering qualifications and professional development in early education and care. Our surplus for purpose philosophy enables us to provide valuable community support services to seniors, people with a disability and the most vulnerable and disadvantaged members of our community. Choose us as your preferred child care provider – we offer quality services and the benefit of being able to positively contribute to your community. Click here for more information on our children’s services. Choose and invest in a rewarding career in early education and care and obtain your qualification or further your professional development with us. Click here for more information on qualifications and professional learning. Get involved with our charitable community programs by donating, volunteering or spreading the word. Click here for more information on our community services and click here to get involved. Our experienced team of qualified educators specialise in responding to the educational and care needs of all children, including early childhood education and care (long day care) , out of school hours care, holiday programs, family day care and in-home care. We deliver transport, social inclusion, recreational and skills development programs for seniors and people with a disability through in-centre, in-home and in-community settings. We provide food, accommodation, clothing and other essential services to the most vulnerable and disadvantaged people in the community, with a focus on empowering them to create better futures. Our registered training organisation specialises in delivering a variety of education and care qualifications as well as professional learning and support for children’s services. 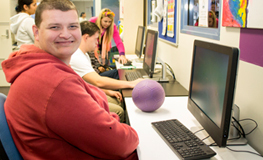 Our registered, independent secondary school is designed specifically for disengaged young people who are unable to access the mainstream schooling system. While some community services are provided on a fee-for-service basis or funded through government contracts, our charitable programs rely on strong corporate, philanthropic and community support. We are endorsed to receive tax deductible donations. Communities@Work is a public company limited by guarantee and is governed by a volunteer Board of Directors. We have a paid workforce of up to 700 staff, engage 100 self-employed family day care educators and harness the passionate commitment of around 130 active volunteers. *A social enterprise applies its earned revenue to achieve social, cultural, community economic and/or environmental outcomes.